Telemetry data from 15 individuals of the lesser spotted eagle and 2 short-toed eagles. Information on the dynamics of the daily, seasonal and year-round movements of the lesser spotted eagle and the short-toed eagle. Information on land use methods within feeding grounds. Information on the prey abundance for both species obtained from studies of small mammals and reptiles carried out in places most frequently used by birds during hunting and in places they avoided. Information on breeding success, causes of mortality and threats to about 150 nests of protected birds. Data on the most dangerous sections of medium voltage lines. Information on the location of 146 new nests requiring the creation or correction of the boundaries of the protection zone, and information on the 70 nests requiring reconstruction or reinforcement. Preparation of the conservation strategy based on the current legal situation of nest zone protected birds, habitat preferences and main threats affecting these species, with particular emphasis on the specificity of the Lublin region. Identification risk areas where development projects could negatively affect target species. Installation of 40 special breeding boxes for the eagle owl and reinforcement of 20 lesser spotted eagle nests and 15 black stork nests. During the four years of the implementation of the project, 23 adoption attempts were made, which resulted in raising 14 "additional" chicks. Restoration of 135.9 ha of meadows and pastures. Meadows are still managed as part of maintaining the ecological effect of the project. Securing of over 300 medium voltage line posts. All sixty planned boxes were installed, two in each of the identified territories. In the first year of implementation, the boxes were secured with a spike collar mounted under and above the box. During the monitoring of occupancy of the first 30 boxes installed in the first year, traces of marten were found, which questioned the effectiveness of this type of security. The boxes assembled in the following season were secured in a different way, using a PVC made wide band mounted as in the previous method - above and below the booth. From the start of the project, information about 146 nests, which required creation or correction of the boundaries of the existing protection zone, was submitted to RDOŚ in Lublin and Rzeszów. At the time of writing, 100 zones were created pursuant to the decision of RDOŚ directors. Three seasons of prey monitoring (small mammals) and 3 seasons of phytosociological monitoring were carried out. It turned out that the restored meadows and pastures, where mowing and grazing continued, after few years had a smaller share of invasive and undesirable species and the structure of sward was more conducive to feeding birds of prey. Also, the results of the food abundance monitoring indicated a greater abundance of small rodents in the meadows managed compared to the meadows where the use was discontinued. In addition, the largest part of the restored meadows was also a place of regular feeding of the only known in the country pair of short-toed eagle. Shortening the distance between the nest and feeding grounds, might have resulted in increased nest supervision by adults, which in turn could explain the fact that in 2018, the birds managed to raise a chick for the first time in a few years. Monitoring of the medium voltage lines secured as part of the project, revealed no victims of electrocution, which indicates 100% effectiveness of the adopted method and clearly indicates the legitimacy of the task. With regard to the monitoring of mounted platforms, it is worth noting that in 2017 breeding season, there were 17 occupied platforms, of which 7 were occupied by black storks, 8 by lesser spotted eagles and 8 by eagle owls. In 2018, birds occupied 18 platforms (1 for the lesser spotted eagle, 8 for the black stork and 9 for the eagle owl). In the case of nesting boxes for the Boreal owl, despite the monitoring of occupancy in 2017 and 2018, there was no evidence of nesting birds in the boxes. In a few of them, the presence of pellets was found, which indicates that birds visited them. Ornithological monitoring covered about 150 nests and more than 250 territories. Two sociological study reports were developed. In the areas where educational activities and practical conservation measures were conducted, an increased awareness about threats was recorded as well as a better attitude and readiness to engage in their protection. As part of the LIFE project, 151 workshops were organized for children and school youth, and 33 workshops for farmers in which 3064 and 697 people participated respectively. There were also 3 meetings with hunters, where 66 people were present. On August 21-22, at the Recreation and Training Center "Zacisze" in Zwierzyniec, we organized a conference summarizing our four-year project. Representatives of the National Fund for Environmental Protection and Water Management, External Monitoring Team, Regional Directorates of Environmental Protection in Lublin and Rzeszów, beneficiaries of other LIFE projects, representatives of National Parks, Forest Districts and members of non-governmental organizations dealing with nature protection were invited to participate in the meeting. Participants included contractors for individual works and other people involved in the project. The first day of the conference was a seminar, during which the speakers presented the results of research and works devoted to zonal species, implemented both as part of the LIFE project and other scientific ventures. The second day of the project was a field trip. The first of its points was the Educational and Museum Center of the Roztoczański National Park, where courtesy of the Director of the Park, participants of the meeting could see the exhibition "In the land of fir, beech and tarpana" presenting the natural and cultural values ​​of Roztocze. A certain conclusion of the works on recognition of the state of preservation of the population of zone-protected species, their habitat requirements and the threats affecting them, was the preparation of the “Conservation strategies for zone-protected birds in the Lublin region”. This document, apart from delivering synthetic knowledge on biology, threats and the currently functioning methods of protection of zone-protected species to the interested parties, particularly emphasised the issues related to inclusion of the protection of this group of birds in the planning processes operated by the units of administration. Assuming that the data available in the subject document will be used at the early stages of investment planning, it will be possible to minimise the conflict between the activities of humans and birds. The strategy contains the most recent data on the distribution of selected species of zone-protected birds (also available in the GIS format), their threats and habitat requirements in the conditions of the Lublin region. One of the elements of implementation of each LIFE project is the development of the Layman's Report. It is a publication made in a non-specialist language aimed at presenting the project's objectives, the actions taken and the effects obtained, of course, with colorful photographs that often best show the achieved effect. We encourage you to familiarize yourself with the content of the report, which is available in the electronic version HERE, and in the "paper" version is waiting for interested in the LIFE project office, on Mełgiewska 74 street in Lublin. 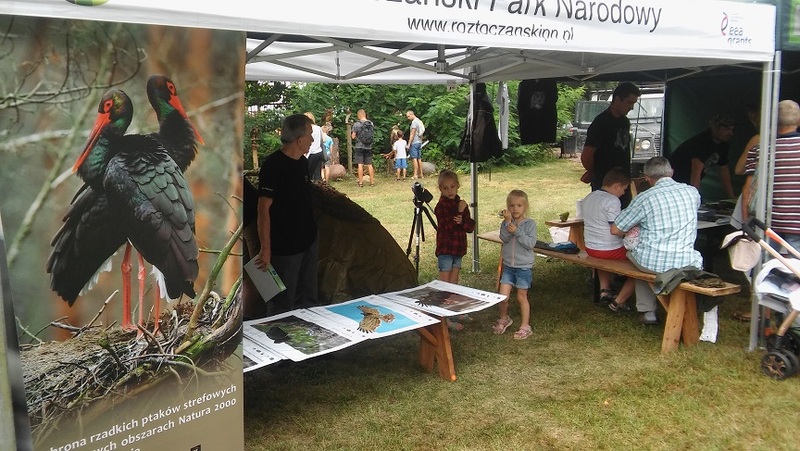 On 11 August 2018, the 10th edition of the outdoor educational event "Open day of the Roztocze National Park" took place. Despite the initially unfavorable weather, about 2,300 people took part in the event. The theme of this year's educational event was an extremely diverse world of birds. 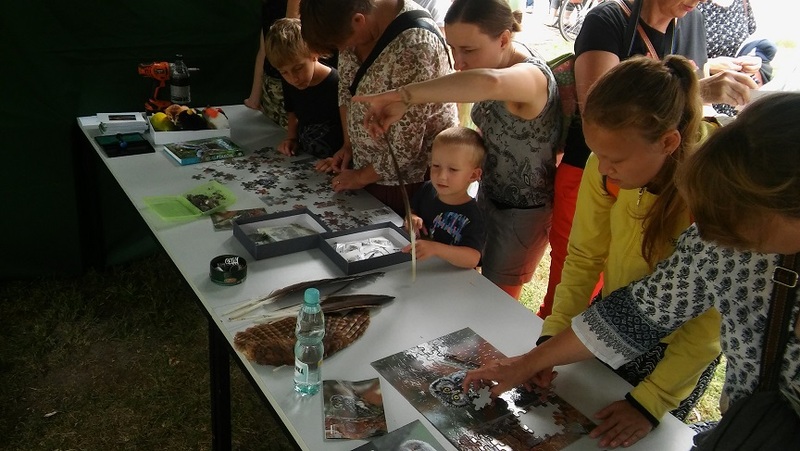 Competitions, games and nature animations organized in front of the Educational - Museum Center building gave the opportunity to get to know the avifauna more closely, as well as check its ornithological knowledge. 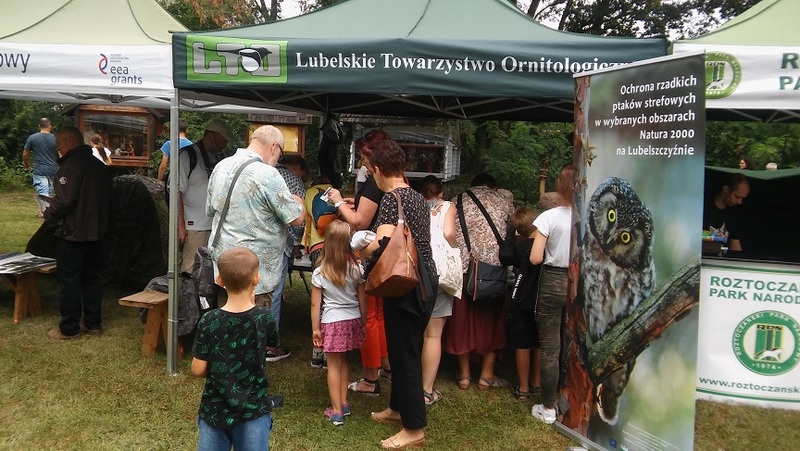 The Lublin Ornithological Society could also be missing from such an event, which participants presented the scope of the Society's activity, including, first of all, the works carried out under the LIFE project. 10 May 2018 Request for tender for the "Preparation of the LIFE13 NAT/PL/000060 Project Diaporama"
"Preparation of the LIFE13 NAT/PL/000060 Project Diaporama". The content of the request for proposals, together with the attachments, can be downloaded here. "Purchase and delifery of the drone". The content of the request for proposals, together with the attachments, can be downloaded here. As part of the LIFE project “Conservation of nest zone protected birds in the selected Natura 2000 sites in Lubelszczyzna region” we have installed information/education boards. The subject of the boards was related to the place of their installation, you can find specific details about each board on our website www.strefowe.lto.org.pl in the “Promotion” tab. The first of the boards was dedicated to the task of restoring convenient feeding grounds for the lesser spotted eagle by recreating unused meadows and pastures. Its location could not be other than the edge of our pasture near Zamch, which was mowed for the first time in many years as part of the project. Currently, thanks to the grazing Polish koniks, that bravely work on maintaining the environmental effect of the LIFE project, the place is becoming an increasingly popular tourist attraction. The topic of the second board is, unfortunately, dominated by the still existing problem of white-tailed eagles poisoning, which is particularly common on the southern edge of the Solska Wilderness. In order to once again draw the attention of the local inhabitants to the essence and cause of the problem, apart from the information campaign conducted earlier (classes with children, meetings with farmers, disposition of folders and posters), we decided to leave a lasting trace of the information campaign in the local landscape. Thanks to the courtesy of the management of the Cultural and Sports Centre in Cieszanów, we installed the boards in front of the building of the Culture Center in Stary Lubliniec. Another action that has been commemorated in the form of a board was the installation of shields against bird strikes on the medium voltage lines. Following the successful cooperation between LTO (Ornithological Association in Lublin) and PGE Dystrybucja S.A., at the power station in Tyszowce, we installed a board informing about the assumptions and effects of this task. Near this place, many secure lines meet so the chosen location helped to present the task both in theory and in practice. The fourth board, which thanks to the courtesy of the Forest Inspectorate of Strzelce was installed in the forest parking lot near Maziarnia Strzelecka, was devoted to the issue of the lesser spotted eagle adoption as a method of limiting losses in breeding caused by the phenomenon of the so-called siblicide. Also, in this case, the location of the plaque was not accidental - Strzelecki Forests have one of the largest populations of this species in the region. Also in the forest areas, with the consent and participation of the employees of the Parczew Forest Inspectorate, we installed the last of the boards. It was built near an educational shelter located near the nature reserve Parczewski Forests, within the boundaries of the Natura 2000 area of the same name. The subject of the board definitely corresponded to the specificity of the place where it was founded - in this case, the described task was connected to the assembly of breeding platforms, with particular emphasis on breeding platforms for the Eurasian eagle-owl, which is almost the flagship species of these areas. 20 April 2018 request for proposal: "Purchase and delifery of the drone".